It's tough to explain to people exactly what this "air guitar seminar" thing is. Especially, you would think, at a tech/business conference in Oulu, Finland -- at 8 a.m.
Nope. Because once you SEE IT, you GET IT. When it's this early, even when they're excited to attend the conference, attendees are -- how do you say it -- reserved. I was scheduled for a mere 15 minutes with zero introduction and the task of getting the entire conference fired up and ready for a great day of learning and inspiration. Air guitar, and the concepts of collaboration and creativity, have a way of cutting through all age groups, backgrounds, and even language barriers. So I'm happy to say that report that, once again, the air guitar seminar transformed the crowd. "The day went wild when the former Eric Mean Melin, world champion of the Air Guitar, took over the audience with a quarter-hour, inclusive air guitar show. A salient crowd fell silent in Melin's quick-training session, during which the choreography was played together at the end of the program number." 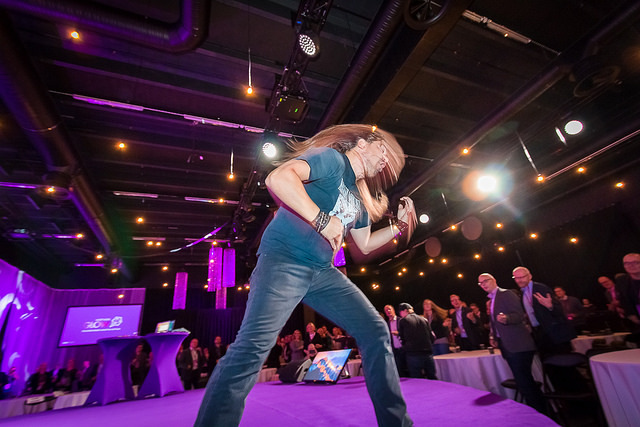 Hit me up to see what how the air guitar seminar can start your conference off right, leaving your attendees refreshed, inspired, and excited. I spoke about creative challenges at TEDxLawrence. My TEDx Talk, “How Air Guitar Can Reveal Your Own Creative Process,” takes the creative process apart, dissecting it bit by bit to reveal the very real strategy behind what it takes to win a very unreal event—the Air Guitar World Championships. I believe Eric "Mean" Melin is the best spokesman to cover finding your voice and personal/corporate branding. We cover some great topics on developing your brand and how to ensure you are bringing your best self forward. Here's the video from the AAF-KC Gas Can Creative Conference. This session was the highest rated of the day and inspired me to expand on the concepts introduced and refine the message of creativity. In late 2012, I embarked on the biggest creative challenge of my life. 10 months later, I would be crowned the World Champion of Air Guitar. What I learned from my own experience has now become a template for all of my creative ad, marketing, and social strategy from here on out. Eric "Mean" Melin is an Air Guitar World Champion and TEDx speaker who has created a series of fun and useful air guitar-related programs designed for multiple events: All-day seminars, keynote speeches, creative workshops, interactive group projects, mock competitions, lip-sync battles, and flash mobs. Each program boosts and encourages different aspects of creativity, communication, and problem-solving. You've never heard stories like this before and you won't believe how applicable these sessions are to improving work life in all forms. Thank you! Eric will get back to you ASAP. #fococreate - thanks for bringing Mean Melin to the social media workshop. Air guitaring & creativity are more than raw talent! @SceneStealrEric you rocked #gascan. Can't stop telling people about your story!